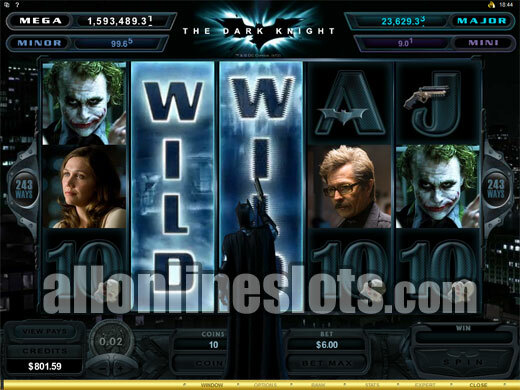 The Dark Knight is a Microgaming progressive slot based on the 2008 film. 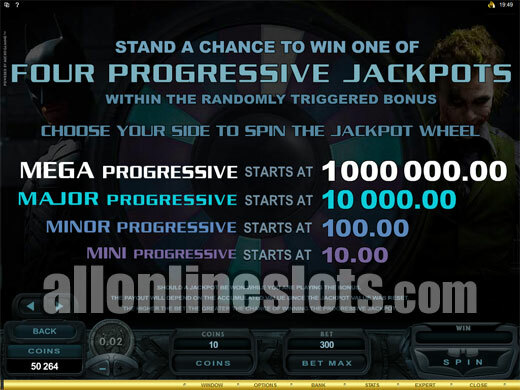 The game is part of the Mega Moolah progressive network which means there is always at least a million to be won. It also has stacked wilds a range of bonus features. 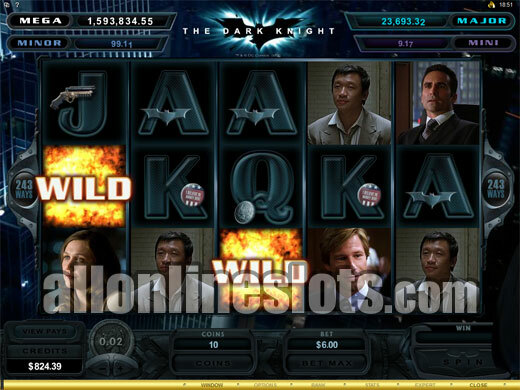 The Dark Knight is 243 Ways progressive video slot from Microgaming. It's based on the hit 2008 film that starred Christian Bale as Batman and Heath Ledger as the Joker. 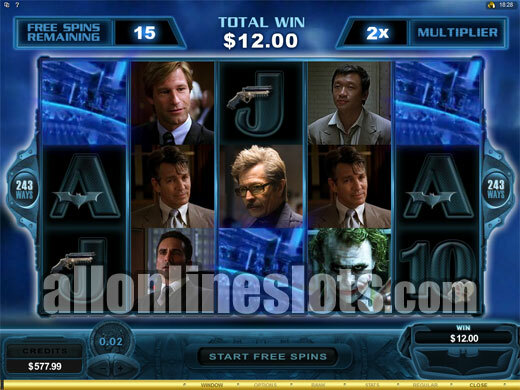 The game has a range of bonus features, stacked wilds on all reels and is connected to the Mega Moolah jackpot network which means you can always win at least 1,000,000. 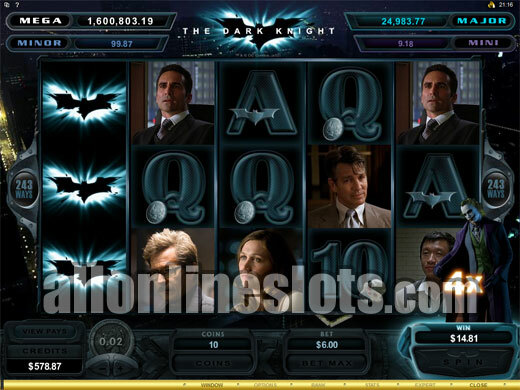 The game replaces the very popular Lord of the Rings slot and features identical game play with a new Batman theme. Seeing as the Lord of the Rings was arguably one of the most popular Movie theme online slots of all time, The Dark Knight has a lot to live up to. As with most 243 ways slots you do not have to bet on individual lines. Instead a 30 coin bet activates all ways to win. If you want you can bet up to 10 coins per way for a 300 coin max bet. At most casinos the game comes in only the 0.01 and 0.02 coin sizes. The first thing you notice when you start playing The Dark Knight are the Cinematic Spins where on each spin the background turns into a short clip fro the film. While this does look impressive we found that it distracted a bit too much from the main event on the reels. Good to see that you can switch the Cinematic Spins off via he Options Menu. The Batman logos are wild are are stacked on all five reels. 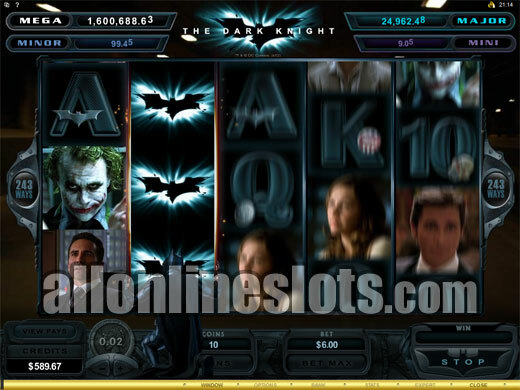 Top line pay is 400 coins for either five Batman Logos or five Batman symbols on an active line. While this is clearly not a huge jackpot on one line you can get a whole screen of wild Logos. This gives you a much more impressive 97,200 coin win. After the two ways to hit for 400 coins the next highest pays are 350 coins for five Bruce Wayne symbols followed by 300 coins for five Joker symbols. From there the rest of the way wins come in at between 250 and 60 coins. Again the stacked wilds mean you can get the same wins on a lot of ways per spin. Batman drops on to the reels and randomly turns symbols wild. The Joker Graffiti symbols are the scatters and are the key to winning the free spins. 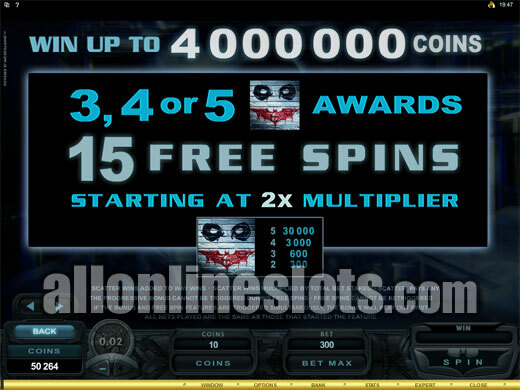 Get three or more and you win 15 free spins with a starting multiplier of X2. 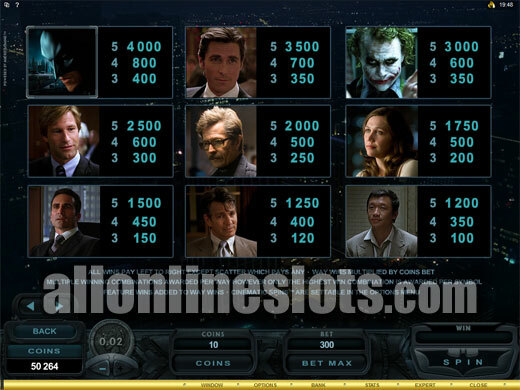 During the free games the Joker or Batman can appear to award more free games, additional multipliers or one of the various extra bonuses. Maximum multiplier is X5 and the free spins cannot be re-triggered even if you hit the scatters on the feature. 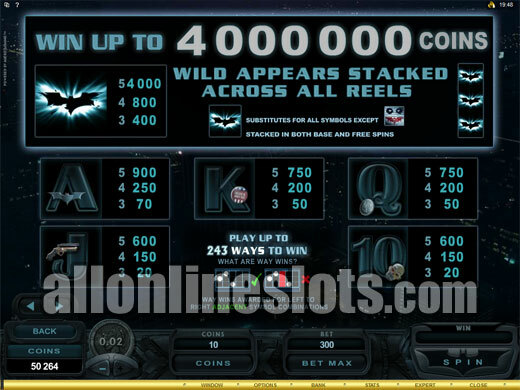 At the highest multiplier a full screen of wild Batman logos pays a very nice 486,000 coin pay for the lowest bet level and a huge 4,860,000 coin win if you're playing the max of 10 coins per spin. 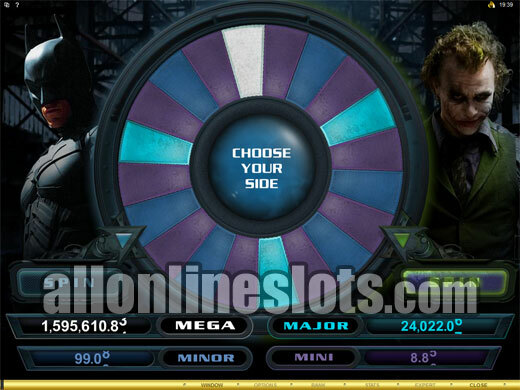 At any time when playing The Dark Knight you can be awarded the Mega Moolah Bonus. 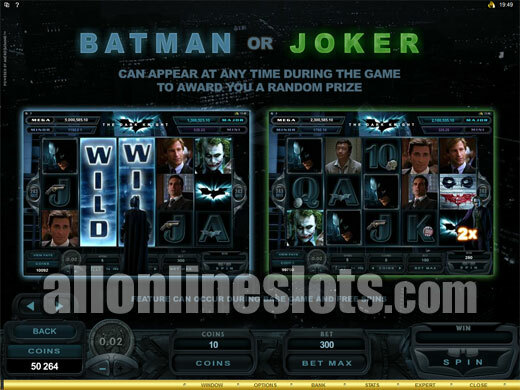 Once triggered you move to a second screen stage where you can select either Batman or the Joker (Preview). The wheel then spins and you win based on the highlighted segment. 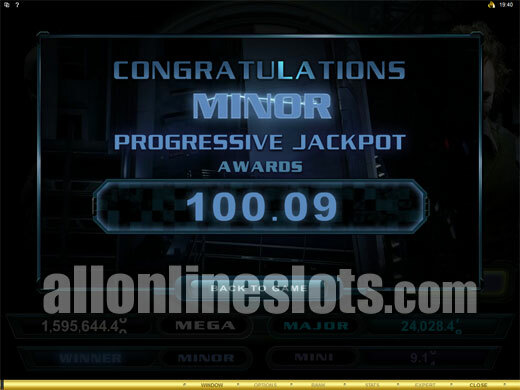 Hit the Mega jackpot and you are guaranteed to win at least 1,000,000.00. 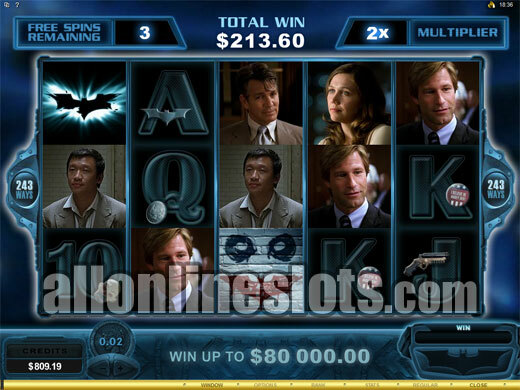 In the end, The Dark Knight is yet another blockbuster game release from Microgaming. 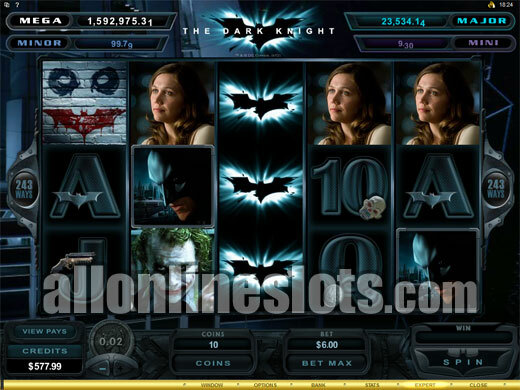 Whether or not you're a Batman fan the game offers some huge jackpots on the reels and even bigger jackpots via the Mega Moolah bonus.